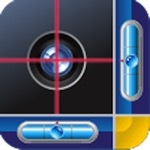 sightLevel enables you to turn your iPad2 or iPhone into a virtual laser level. Your virtual tool belt just got handier! “sightLevel Pro is now a universal app, so you can utilize it on both your iPad2 and iPhone at no additional cost,” Karen Auman said. “We think that you will love sightLevel’s new functionality as well as its updated look.” The engineered user interface is designed for both the iPad2 and iPhone displays. Using the built-in camera functionality, simply hold your iPad2 up in landscape view, tilt the iPad2 until the bubble is centered within the level, and use the horizontal red line to determine the slope. This app has a 3.0 star rating (169 ratings). It occupies the 276561th position in our ranking with 55 points. It is among the 25% best ones of its category and among the 10% best ones of the overall top.